We are just moving into a very busy period for the garden, tidying up after a warmish and very wet winter and preparing for the spring. Check for damage to supports for climbers and wall shrubs, remove dead and broken branches from shrubs and trees, check for fungal infections such as blight on box and holly and check for bracket fungus on trees and call in a tree surgeon if necessary. Hopefully everybody now has completed winter pruning on their wisteria but, if not, I have’ a very very little’ availability over the next couple of weeks. As the gardens are now mostly dried out we can get onto the soil and start tidying up and getting rid of those pesky weeds that have started growing very early – although the frost over the last week has at least brought that to a sudden stop. Some people may well have spots in their garden which have started flooding every winter and this spring may be the time to consider some changes to these areas, for example raised beds or planting shrubs and trees which can survive both wet and dry conditions. If you haven’t done it already any perennials left for winter interest should be cut back. This includes the grasses. 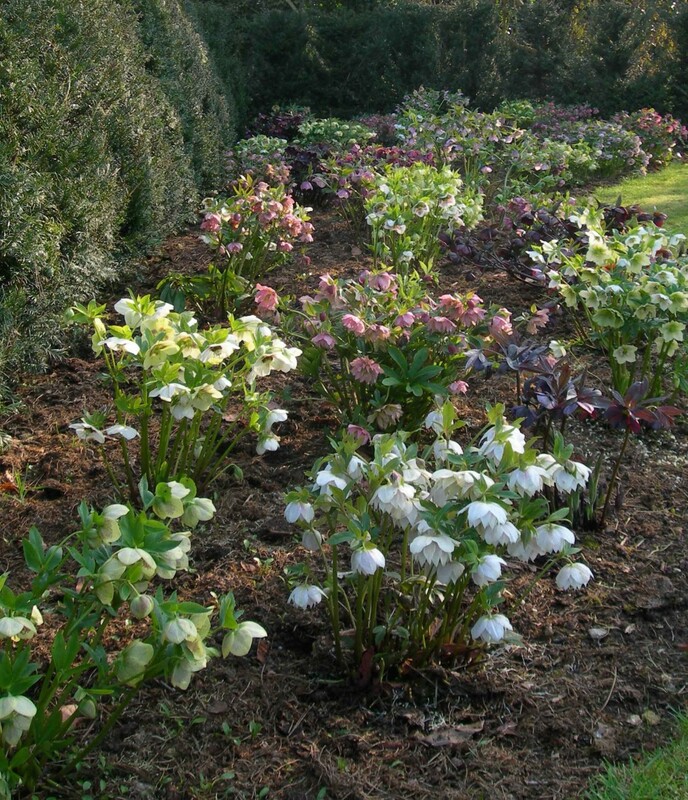 Also remove the old untidy leaves of Hellebores to give a better view of these beautiful flowers and keep deadheading pansies to encourage flowering through spring. Galanthus (snowdrops) Hyacinthoides non-scripta (English Bluebells) and Aconite hyemalis are all best moved ‘in the green’. When the flowers fade dig up large clumps, split them and replant in new positions. If you have too many give them away to friends and neighbours. This is a far more successful way of increasing the number of plants than attempting to plant bulbs and corms. Do not mistake our native bluebells for Spanish bluebells (Hyacinthoides hispanica) which are hugely invasive, without scent and virtually impossible to remove once established in a garden. They are best removed from any garden as soon as possible. Now is the time to prune Group 3 Clematis, generally large flowered, these are the summer and autumn flowering clematis. You will be also pruning Group 2 probably by the end of March. If you are not sure which Group your Clematis belongs to this article by Sue Sanderson for Thompson and Morgan is very helpful.http://www.thompson-morgan.com/how-to-guide-for-pruning-a-clematis. Prune winter flowering shrubs as soon as they finish flowering. Not all will need pruning; Viburnum tinus and winter-flowering jasmine (Jasminum nudiflorum) for example can be thuggish and will benefit from a hard prune back if they have outgrown their required space – others may only need a light trim or nothing at all. When your Hostas start to show above the ground you can divide larger clumps through March. Hostas are very forgiving and if you have a huge compacted clump that it is impossible to get a spade or fork through try a bow saw – it worked brilliantly for me last year. Bush and shrub roses can be pruned through March. Climbing and rambling roses should have been pruned in the autumn with any renovation done in the winter. 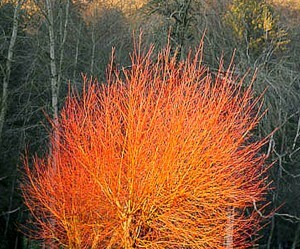 Coloured winter stems on Cornus and Salix can be pollarded or coppiced in March to encourage coloured stems for next winter and keep the size down. Check out any stored Dahlia tubers as they might either be drying out too much or (if you have a leaky hut like me) getting damp and rotting. Once plants are pruned and any sign of blight removed (including any leaves), mulch these areas thoroughly. 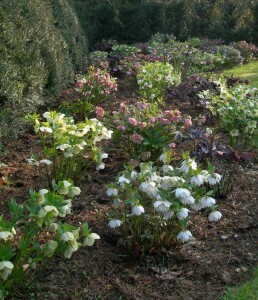 Many gardens around Ripon have sandy soil so mulching can take place very soon. For heavier clay soils it will be better to wait a bit longer. It will also be worth considering extra feeding for shrubs and trees this year once growth gets underway and all danger of frost is over. The extreme wet weather will have washed nutrients out of the soil.